A majority of patients who come to visit Dr. Mack—your local Bettendorf, Maquoketa, and Eldridge, IA orthodontist—will end up opting for traditional braces as a means to straighten their teeth. However, while braces are the most common type of orthodontic treatment, there are many different kinds of braces to choose from. Depending on your unique needs and smile goals, our orthodontist will help you select the type of orthodontic treatment that’s right for you. To investigate the different kinds of braces we offer at Mack Orthodontics prior to booking an appointment, continue reading below. Before delving into the different types of braces our Bettendorf, Maquoketa, and Eldridge practice provides to patients, it is important to understand the distinction between fixed and removable appliances. Fixed appliances like braces are attached to the teeth by metal bands or special cement. They aren't normally taken off until treatment is complete. Removable appliances on the other hand, such as Invisalign aligners, are typically worn some 22 hours a day, but can be easily taken off as needed. Note—while Invisalign aligners can be effective in treating mild to moderate orthodontic issues, fixed appliances are generally needed for more comprehensive treatment. Thus, they are typically the more reliable, frequently used option. 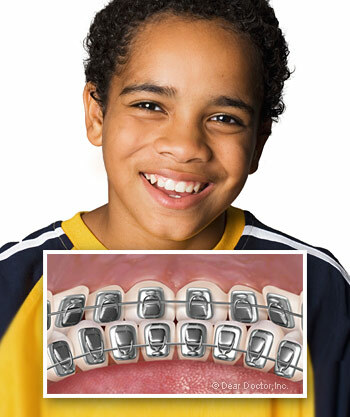 Traditional metal braces remain by far the most common type of fixed orthodontic appliances utilized by orthodontists. Typically made of high-grade stainless steel, they consist of metal bands that wrap around the back molars, and smaller metal brackets that are cemented to the front surfaces of the other teeth. By means of a thin, springy metal wire that runs through the brackets, your teeth are gently guided into the proper position. This archwire may be fixed to the brackets by flexible elastics, metal ties, or other types of clasps. 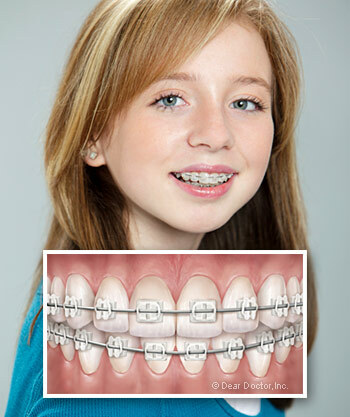 Metal braces remain the most popular form of orthodontic treatment. Reliable, effective, and economical—they are a time-tested option that does not disappoint. 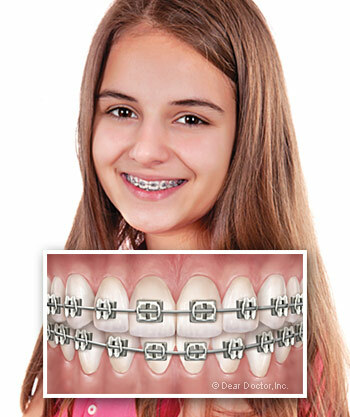 Moreover, today's metal braces are smaller, lighter, and more comfortable to wear than ever before. They even come with the great personalization option of choosing your own set of elastic colors, which lends to a less traditional look. While traditional metal braces are very popular, they are not longer the only game in town. Ceramic braces (otherwise known as clear braces) are a new variation on the conventional system of braces that provide a far less noticeable method of treatment. Ceramic braces utilize the same components as traditional braces, except the brackets on the front side of the teeth are made of a translucent ceramic material that blends in with the tooth's natural color. As a result, this system of braces has become a favorite among adults (including some well-known celebrities) because it is a lot less noticeable. Several types of ceramic braces are currently available, and the technology is constantly improving. Although, while their aesthetic appeal is undeniable, there are a few tradeoffs. Ceramic brackets can be less durable than their metal counterparts. The elastic bands that attach to these braces’ archwire does still stain (though typically elastics are changed each month before appearances suffer too greatly). And ceramic braces cost more than metal braces. However, for many people the benefit of having an inconspicuous source of orthodontic treatment outweighs the costs. While ceramic braces certainly offer a less conspicuous look, there is still another system that allows fixed braces to appear even more invisible. Lingual braces can be placed on the tongue side of the teeth. They work the same way that metal braces do, but, since they are hidden behind the teeth themselves, no metal is seen at all. Bare in mind that lingual braces aren't the proper treatment for every orthodontic condition. Special training is required to install them, and they are significantly more expensive than standard braces. They also generally require a bit more time for the wearer to get used to them, and may have slightly longer treatment times. But, if you want to straighten your teeth with the least visible type of braces—and if you qualify as a candidate—then lingual braces might be the orthodontic treatment option you’ve been looking for. If you’ve been thinking about starting orthodontic treatment, contact the team at Mack Orthodontics today. Our orthodontist and his team of talented specialists will help you find the treatment that’s right for you. Book an appointment at our Bettendorf, Maquoketa, or Eldridge, IA office today and begin your journey to a straighter, more beautiful smile.